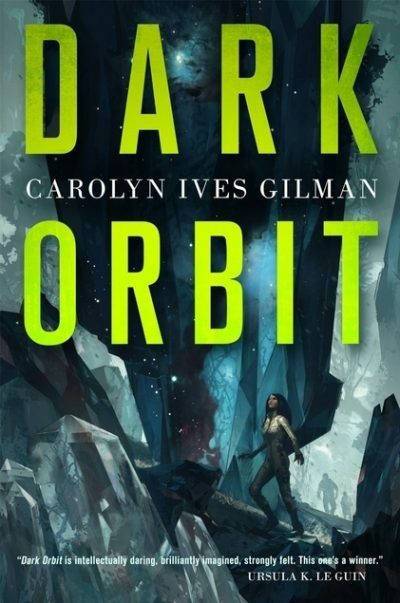 Carolyn Ives Gilman’s 2015 Dark Orbit is a standalone SF novel set in her Twenty Worlds universe. Researcher Saraswati Callicot transmits home to Capella Two only to find that during the years she spent in transit, she was sued for and lost the intellectual property from which she had expected riches. The same light-speed delay involved in matter transmission means that by the time she is reconstituted into a living human, the period during which she could have appealed is long over. Not to worry! Director Gossup wants to recruit Sara for a very important mission. The known worlds (linked to each other by superluminal communication and light-speed matter transmission) were founded by sub-light probes sent out in the era of the great diaspora. They’re all human-friendly, thanks to terraforming. One of the ancient probes, long since written off, has called home unexpectedly. It has found something quite new. The probe is in orbit around a world dubbed Iris, located fifty-eight light-years from Capella. The world appears to be unusually rich in dark matter. Interesting. Even more interesting is its native ecosystem. The other human colonies started off with lifeless worlds which were then terraformed. Significant scientific discoveries are possible! Likely! Although travel to and from the world by light beam will take one hundred and sixteen years1, Sara cannot turn down this opportunity. Sara has a secret side mission: she’s to keep an eye on Thora, an unreliable upper-class adventurer who’s joined the expedition. Well, OK. Not a big deal. How much trouble could one person get into almost sixty light-years from home? The trip to the probe goes as planned. After that, everything goes sideways. A crew member turns up dead, beheaded. The deceased is a friend of Thora’s. The whodunnit (as well as the why and how) is unclear. A cozy mystery on a space probe . Except that’s not what’s going on at all. Iris turns out to be covered in mirror-like structures that, on closer examination, prove to be complex folds in space time. Unique to Iris? Or is dark matter just complex space-time? Another mystery. Thora vanishes. She might have fled, in her flighty way. But no, she just got lost in the folds. Unable to find her way in a realm her senses cannot process she should have been doomed. Instead, she is rescued by … Iris’s indigenous human population. Now the expedition isn’t just a scientific mission: it’s a first contact mission. And a rescue mission as well. A calamity the visitors can barely envision is imminent; to remain on or near Iris would be to die. Pity that one of the side-effects of the peculiar space-time surrounding Iris is to disable the long range teleporters…. Although the Twenty Worlds boast some impressive technology, they seem to have retrenched since the era of the great diaspora. They aren’t sending out any more probes. They seem content to limit themselves to the worlds already settled, which are but a dot compared to the rest of the galaxy. Why the timidity? If the author is aware of this as an issue, she doesn’t address it in this book. It may simply be that the culture, focused on short term profit, cannot see the value in blue sky exploration of unproven systems. The culture of Iris’ indigenous population has been shaped by its unusual environment. They found habitable but lightless spaces and learned to rely on other senses. Indeed, blind since birth, they cannot see when the visitors do bring light: mere exposure to light is insufficient to grant them eyesight, since the relevant parts of the brain pathways are undeveloped. Despite this handicap, they have learned to navigate their odd world skillfully (something the visitors do not realize). It’s not surprising that Dark Orbit was blurbed by Le Guin. Gilman’s Twenty Worlds recall Le Guin’s Ekumen. Both settings feature a human sphere settled in an age now the stuff of legends, a sphere linked by superluminal ansible and relativistic travel. Both writers imagine worlds where societies differ in ways best described by anthropologists. Dark Orbit is in many ways a very traditional SF novel, not least because, even though it takes place in a setting that Gilman has used in other novels2, it’s not a sequel or a prequel. It works as a standalone. Not every issue raised is resolved in the course of the narrative, but most are. It’s not a cliff-hanger. There characters are engaging, the mysteries suitably mysterious, and the experience of reading this makes me wonder why I am not more of a Gilman completist than I am. Off to the book mines for more Gilman! Dark Orbit is available here (Amazon) and here (Chapters-Indigo). 1: Which Sara will not experience, thanks to being reduced to information while being transmitted. Thank you! Arkfall is one of my favorite short stories of all time. Will be picking this up ASAP. To be clear, does the probe ship land on Isis, e.g. after the murder, or do the inhabitants jaunt up to the ship in orbit through their magic mirrors? And is the first unfortunate death the final-frontier version of an industrial accident? I'll have a word about spelling separately.